ABS automatically does a lot of tasks that save time and effort. For that to work, you need to enter some basic information. This is a one-time setup that doesn't take much time because we've already done a lot for you. This process makes ABS work the way you do. For just one example, when you enter your carriers and their policy commission, ABS will compute the expected commission to help reconcile your commission statement. There are other examples below. ABS will work without this initial setup, but you would be foolish to skip it. Doing so will make you work harder, and you won't reap the benefits you paid for when you invested in ABS. 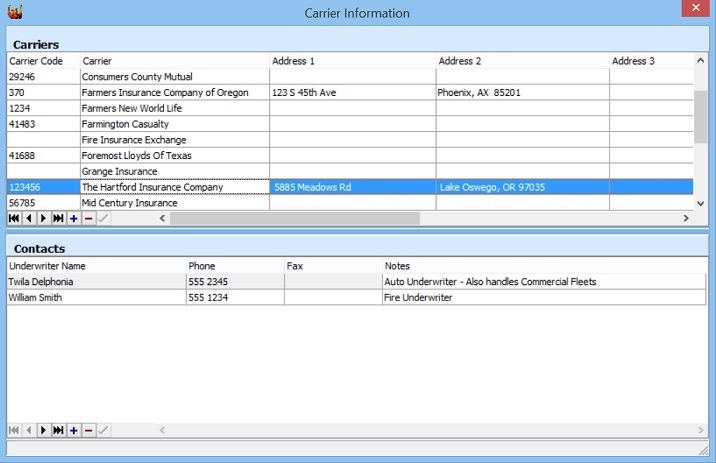 With the program open, display the Carrier List by clicking Admin > Carrier List. You will see a few carriers listed that we use as an example. Enter carriers with which you do business, and delete those you don't. Do not delete the ones you have, or have had appointments with. They are important for historical policy information. The grid, shown at the right, contains carrier information you must enter. Typically, this will be insurance companies with which the agency has appointments. This grid scrolls horizontally to expose fields not shown in this illustration. For example, the NAIC field and carrier Website address are hidden (to the right). Make sure to enter NAIC so ABS can pre-fill ACORD forms. Make sure to enter the web address for each carrier so ABS can take you there automatically. Detailed, step-by-step procedure with illustrations can be found in the user manual. Setting up the policy list is critical to commission calculation, and to efficient data entry. This must be done once for each policy type that you sell for each company. For example, let's say you sell both preferred and standard auto policies for Ajax Insurance. Let's also say that Ajax Insurance, hypothetically, pays 20% for a new preferred policy, and 10% for a new standard policy. You must enter each policy type so that ABS knows which percentage to use when computing commission. This may seem tedious, but it only needs to be done once, and by doing it now, you don't need to repeat the process for each policy you sell. Again, this entire procedure is illustrated in the user manual. 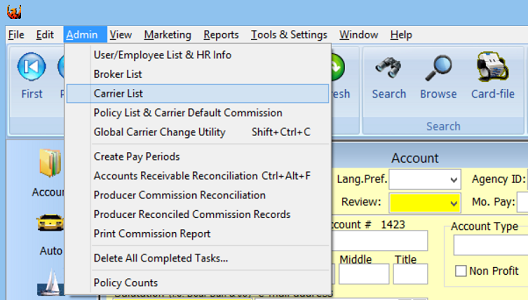 Begin by clicking Admin > Policy List & Carrier Default Commission from the main menu. That menu selection opens the Commission Wizard. After selecting the previously entered carrier, policy setup is a simple 3 step operation the software will guide you through. First, select the previously entered Insurance Company and click Next. Select the policy type. Let's say we are entering one of the two auto policies we mentioned above. At this point we just select the general policy type -- Auto. Click Next. Enter the policy name. When entering new policy information, enter the actual policy name used by the insurance carrier. If it's not available, or you don't know what it is, enter something meaningful and descriptive, such as Preferred Auto. However, it would be worthwhile to use the actual policy name used by the carrier. Whatever you enter here will be inserted into many of the standard letters. The last step in this process is to enter the percentages paid by the carrier to the agency. You need to enter New Business Commission and Renewal Commission. For each, you can enter percentages for up to 5 tiers, if needed. Make sure to enter percentages in a decimal format. In other words, 0.10 = 10%. If you don't know what the Cutoff dates are for this policy, contact the carrier. Until then, the default values should be pretty close. While ABS can help calculate commission you pay your producers, there are several things that must be done so that ABS knows what you want. Perhaps the most obvious is how often you write pay checks, or Pay Periods. This is an administrative task, so it can only be done by a user who has administrative privileges. This procedure is only available from the Admin menu. 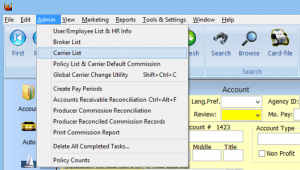 To setup Pay Periods Click Admin > Create Pay Periods. For detailed instructions, read the section in the ABS User Manual. You can edit the contents of most drop-down lists. There are lots of drop-down lists designed to minimize your typing. If you can pick it from a list, you don't have to type it. For example, Auto BI, PD, UM, etc. The program already has the most common values in every drop-down list, but you may wish to remove some values, or add others. If you don't customize these lists, you'll probably be working harder than you need to. Most lists can be edited via the Edit menu. See the user manual for illustrated instructions. The Auto Default Coverage feature is a real time saver. 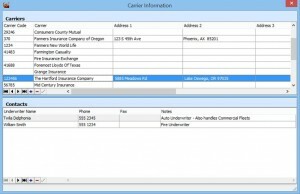 You can establish several coverage profiles that you commonly sell, and enter those coverages by selecting the default. One click allows you to enter your Minimum Coverage Liability Only with a single transaction, or Full Coverage, or Underlying Umbrella, or you name it. You can name the default, establish the limits. When it comes time to enter that data, just select the profile you want and all the limits are entered at once (BI, PD, UM, UIM, Deductibles, etc). See the user manual for details. Tools & Settings > Program Preferences > Global Preferences. Then click the Calendar tab. Detailed instructions are in the ABS User Manual. Tools & Settings > Program Preferences > Personal Preferences. Then click the Word Processor tab. Detailed instructions are in the ABS User Manual. The manual also shows how to edit Word Processor templates to make your correspondence professional, and tailored to your agency. There are a number of other setup items that I won't go into here. If you've read the above topics, you should get the idea that the User Manual is your friend. The important point I want to get across is, if you do the initial setup, it will save you a lot of work, a lot of time, and improve your accuracy. In most cases you can set it and forget it.